Last year's Investec Derby hero was among the leading contenders for the world's richest race, but making his debut on an artificial track, came home 13th of the 16 runners in the hands of the trainer's son, Joseph.Aidan O'Brien feels Ruler Of The World's failure to act on the Tapeta surface was to blame for his disappointing display in Saturday's Dubai World Cup. Speaking at Leopardstown on Sunday, the Ballydoyle handler said: "We didn't know whether he would handle the surface and it looks like he probably didn't. "Joseph said he was grand until he came off the bridle and then he was all at sea." 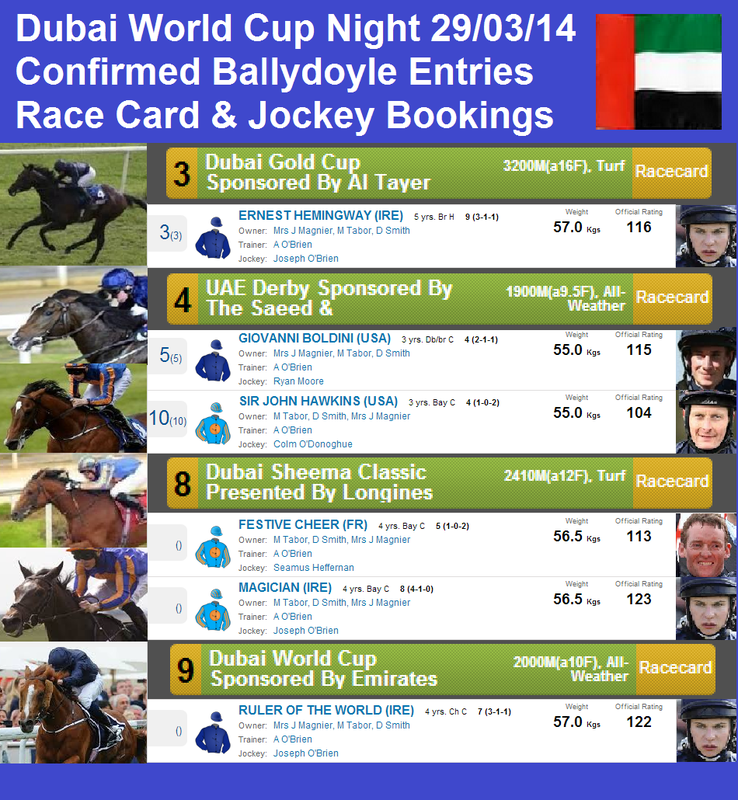 Each of O'Brien's six runners on World Cup night failed to finish in the frame, although both Giovanni Boldini and Magician ran with credit. Giovanni Boldini came home well to grab fourth in the UAE Derby, while last year's Breeders' Cup Turf winner Magician encountered traffic problems on his way to finishing sixth, beaten three lengths, in the Sheema Classic. "Ryan (Moore) was delighted with Giovanni Boldini. In an ideal world he wouldn't have wanted to be so far back, but it's just the way it worked out on the first bend," said O'Brien. "He ran a very good race, he definitely gets a mile, but I'm not sure if he'd get further. He'll probably go for one of the Guineas. "Magician ran well. It was a bit messy on the first bend, we were always going to drop him out, though. Joseph said he gave a blow two furlongs out and he didn't get a lot of help in the straight. "He ran well, we're happy with him and we might train him for the Prince of Wales's Stakes at Royal Ascot. He could run before that, as long as the ground is OK - he wouldn't run on bad ground." 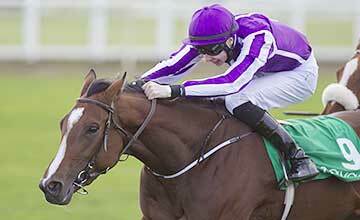 Aidan O'Brien's Bracelet ran out an impressive winner of the Leopardstown 1,000 Guineas Trial Stakes. Balansiya was sent off the odds-on favourite as Dermot Weld and Pat Smullen eyed a treble on the card but she had to make do with the runner-up spot behind Bracelet. Balansiya was a 9-10 market-leader following a spectacular winning debut over the course and distance in early November and all appeared to be going according to plan as she moved sweetly to the lead early in the straight. However, Aidan O'Brien's Bracelet, ridden by the trainer's son Joseph, came out of the pack to challenge from a furlong out and wore down Balansiya to take the Group Three prize by a length. Avenue Gabriel and Harry's Princess finished third and fourth respectively. 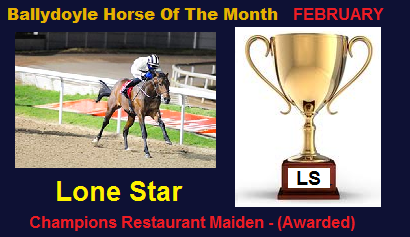 O'Brien snr said: "She did it nicely and she's a filly we think will stay well in time. We're delighted with her and all things being well, she might go to the Guineas (at Newmarket). I'll speak to the boys (owners)." Asked whether he thought Bracelet would stay a mile a and half, the trainer said: "We always thought she would, but Joseph said he wasn't sure there, as she showed a lot of speed. That's why we're thinking about the Guineas." Bracelet was cut to 16-1 from 40s for the Guineas at Newmarket by Sky Bet and made 9-1 (from 16s) favourite for the Oaks. Balansiya carried a lofty reputation into the 1,000 Guineas trial at Leopardstown after she routed her rivals in a course and distance maiden last November, however, she was collared late home in today’s task by 7/1 chance Bracelet. Dermot Weld’sBalansiya went off the 9/10 favourite and appeared to be moving through to pick up the race from Avenue Gabriel in the home straight, but Braceletdelivered a powerful finish once Joseph O’Brien brought her through the field. She won this seven-furlong race by a length. Paul Deegan’s Avenue Gabriel finished third at 5/1. She was beaten a length and a half by the winner. 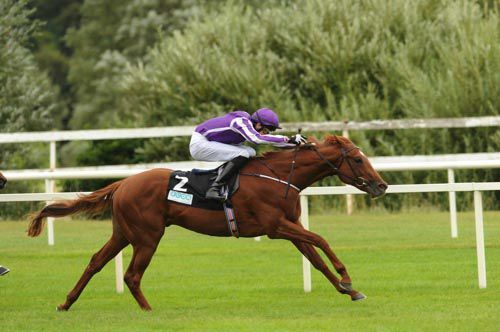 Aidan O’Brien said: “She did it nicely. She’s a filly we think will stay well, probably in time. I’m delighted with her and everything being well she might go to the Guineas. She’s a good mover so you would think she would appreciate better ground. 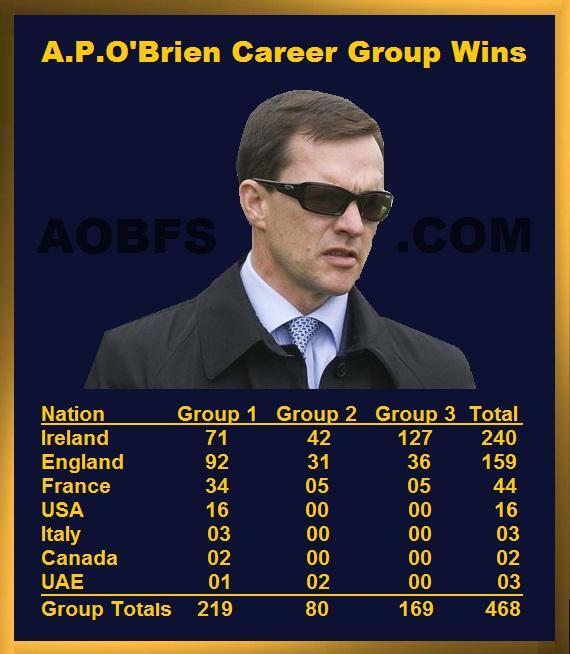 This was Aidan O’Brien’s third win in the last four renewals of this trial, and his ninth success in it overall. Montjeu filly Bracelet has possible engagements in the Irish 1,000 Guineas and the Irish Oaks. This was her first run for 290 days after her victory by a couple of lengths in a course and distance maiden in June last year. 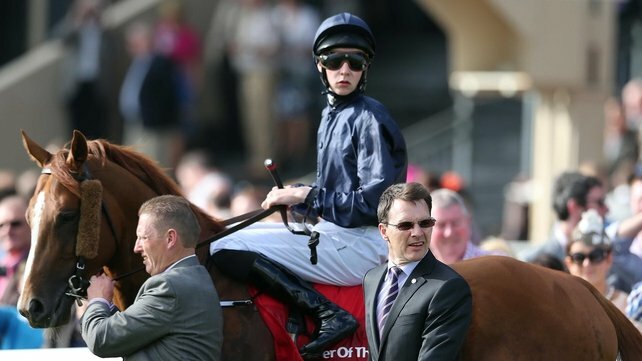 Joseph O'Brien, the man in the hotseat when Ruler Of The World makes his debut for new part-owners Al Shaqab Racing in the Dubai World Cup, believes the colt has the scope to enjoy a long and prosperous season. Trainer Aidan O'Brien's son reached Meydan ahead of his father specifically to partner the Investec Derby winner in some light work on the Tapeta track. The Coolmore horses went out just before 7am on a beautifully warm morning and Ruler Of The World enjoyed himself in a swinging canter, with no questions asked. Joseph O'Brien said: "Ruler Of The World has done plenty of work at home and I just gave him a little canter round to let him stretch his legs. "He seems to have travelled well and is in good form. He's matured and his work has been pretty good. "He just did a hack and a trot. It's very difficult to know whether he will handle the surface which is new to him. "A lot of people forget that at this time last year he'd never seen a racecourse. "If getting to choose, though, I wouldn't have picked stall 12, but it is what it is and well have to make the best of it. "He seems to have wintered well, and it's encouraging that his brother (Duke Of Marmalade) improved from three to four (years of age). There's nothing to suggest he won't do the same. "He has a great attitude and won the Derby on only his third ever start. I would have liked him to have a prep run but there are plenty of big races ahead in which he can be very competitive. "He's ready to get started in what will hopefully be a long and successful season. "He's ready to do himself justice." "He seems to have travelled well and is in good form. He's matured and his work has been pretty good." Harry Herbert, racing adviser to Sheikh Joaan and the man behind negotiations to buy into Ruler Of The World, was thrilled by the purchase. He said: "Sheikh Joaan said weeks ago that he would love to have a horse competing in Al Shaqab silks in the Dubai World Cup. 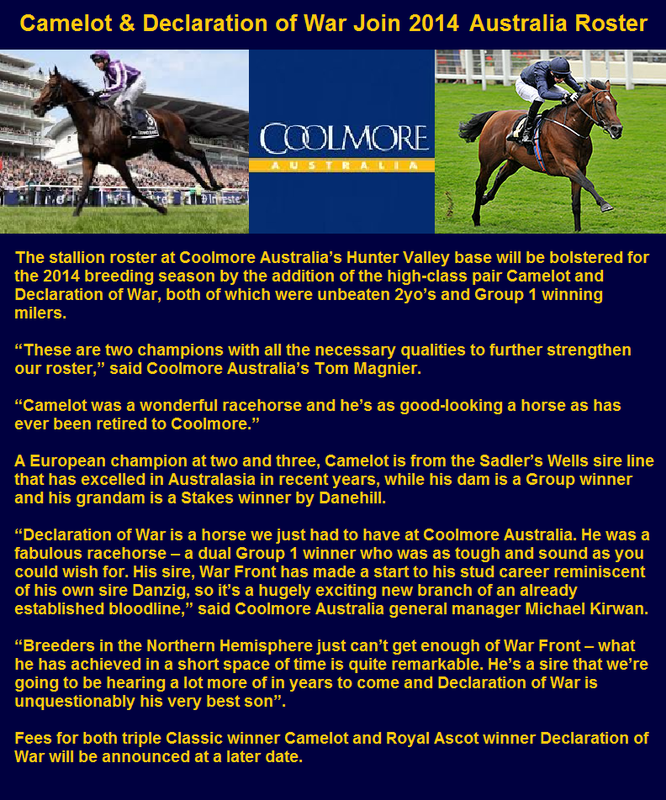 "We had our backs to the wall time-wise and it wasn't easy, but the Coolmore team and John Magnier were amazing. "The negotiations were conducted very much from the top, between Sheikh Joaan and John Magnier. It was just a question of the finer detail. "We have made quite clear our intention of going forward with a new team organisation in the game with new stock, but also looking to buy into proven horses if we can, as has been the case with the likes of Treve, Olympic Glory and especially Toronado." 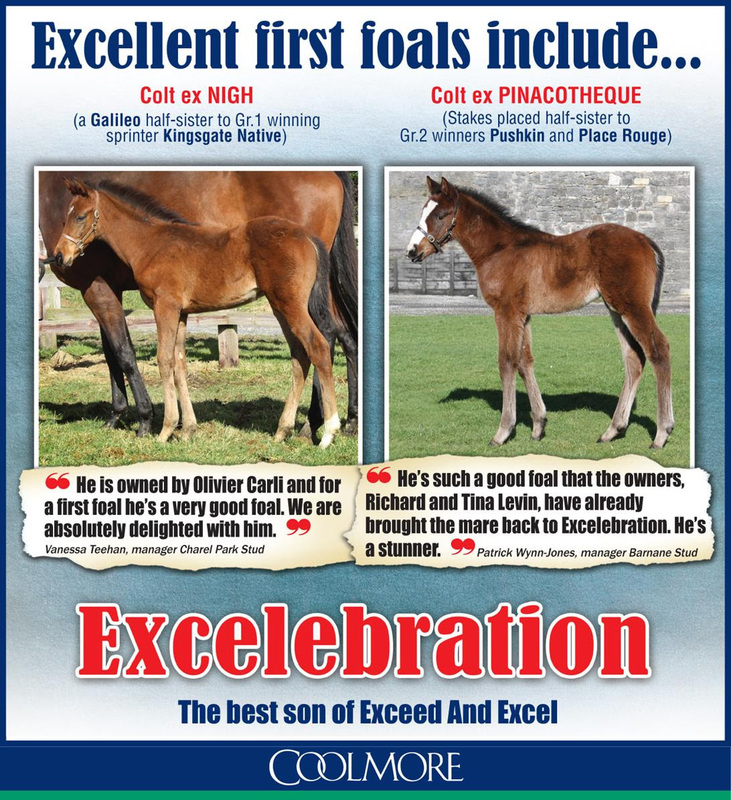 10 Coolmore 2yo named today they are all with David Wachman check out the 2yo page. The Aidan-O’Brien trained Ruler Of The World will have to overcome a wide draw in stall 12 if he is to justify favouritism in the Dubai World Cup on Saturday, but stablemate Magician will start from a far more favourable post as he bids to land the Sheema Classic at Meydan. Investec Derby winner Ruler Of The World will race in the colours of Al Shaqab Racing after Sheikh Joaan Al Thani purchased a 50% stake in last season's Epsom hero. The four-year-old Galileo colt will remain in training with O'Brien and will continue to be ridden by the Ballydoyle handler's son, Joseph. Last year's winner Animal Kingdom broke from stall 12 so the berth is no insurmountable barrier to success. Ed Dunlop's Red Cadeaux, second 12 months ago, fared even worse and will race from stall 14 in the 16-runner field, with William Haggas' Mukhadram next door in 13. Michael Stoute's Hillstar fared better in seven, with Andrew Balding's Side Glance in nine. Vancouverite, African Story and Cat O'Mountain are respectively berthed in stalls three, six and 15 for the Godolphin team. African Story's trainer Saeed bin Suroor is also responsible for the Sheikh Hamdan bin Mohammed Al Maktoum-owned Prince Bishop, who is drawn in gate one. Hong Kong raiders Akeed Mofeed (four) and Military Attack (eight) are unlikely to have too many complaints. Magician drew stall four in the feature turf race on the card, with O'Brien's apparent second-string Festive Cheer in the ninth berth. Former winner Cirrus Des Aigles will have to contend with exiting from stall 15 when the gates open, Marco Botti's Mount Athos is in five and top Japanese mare Gentildonna is in stall 12. Sheikh Joaan Al Thani's Al Shaqab Racing has purchased a 50% interest in the Coolmore-owned Ruler Of The World, last season's Epsom Derby winner. The four-year-old Galileo colt will remain in training with Aidan O'Brien and will continue to be ridden by the Ballydoyle handler's son, Joseph. Ruler Of The World is due to contest the Dubai World Cup at Meydan on Saturday but will now run in the colours Al Shaqab Racing. Al Shaqab's racing advisor Harry Herbert said: "Al Shaqab is delighted to be in partnership with John Magnier, Michael Tabor and Derrick Smith and we are extremely excited to be participating in Saturday's World Cup." 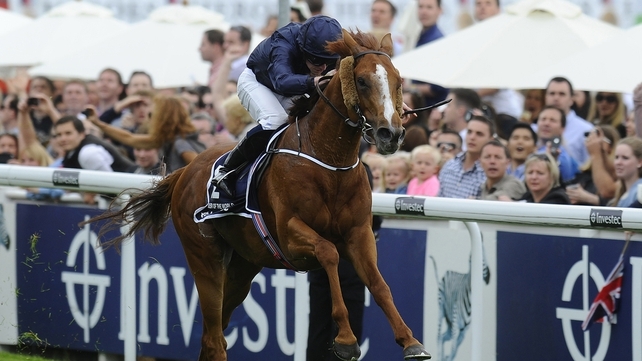 A statement posted on www.coolmore.com read: "Al Shaqab Racing has purchased a significant interest in last year's Epsom Derby winner Ruler Of The World. 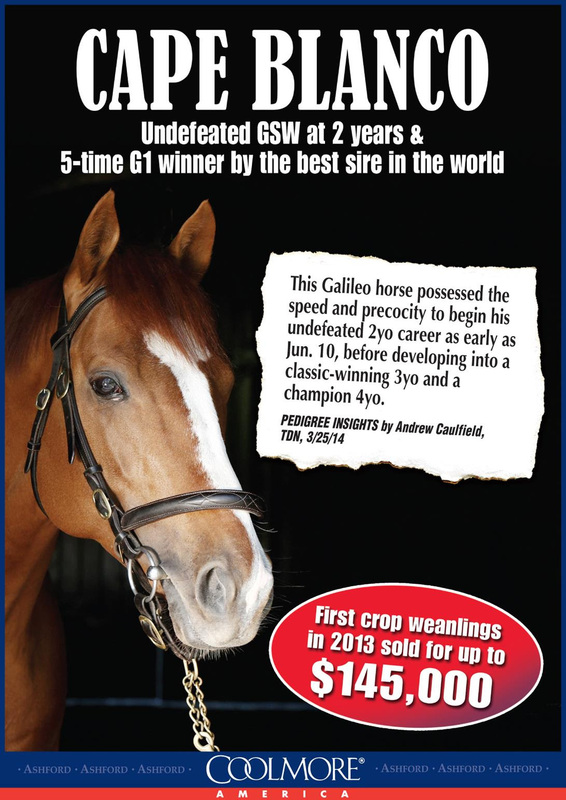 "The son of Galileo will run in the colours of Al Shaqab Racing in partnership with the Coolmore triumvirate of Tabor/Smith/Magnier. 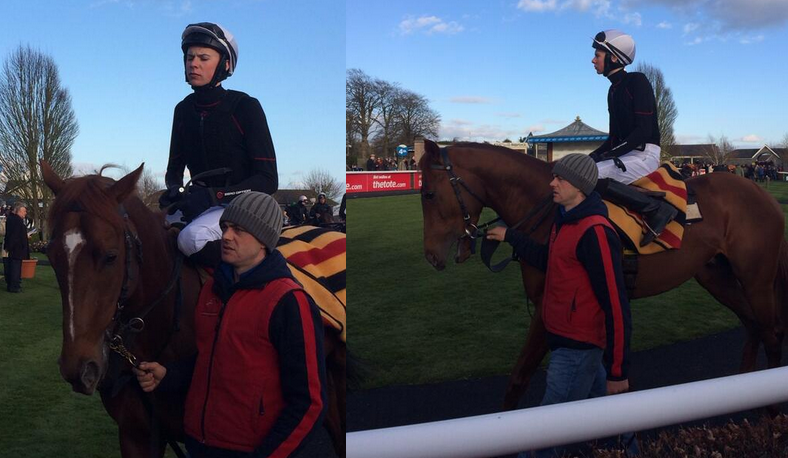 "He will remain in training with Aidan O'Brien at Ballydoyle and will continue to be ridden by Joseph O'Brien. "Ruler Of The World who will retire to Coolmore at the end of his racing career is due to begin his season in Saturday's Dubai World Cup where he heads a team of six trained by Aidan O'Brien." Herbert confirmed a deal had been struck for 50% of the colt. "It's tremendously exciting and the Sheikh is thrilled," said Herbert. "It's been a very recent development, just over the last two or three days, and Al Shaqab have 50 per cent. 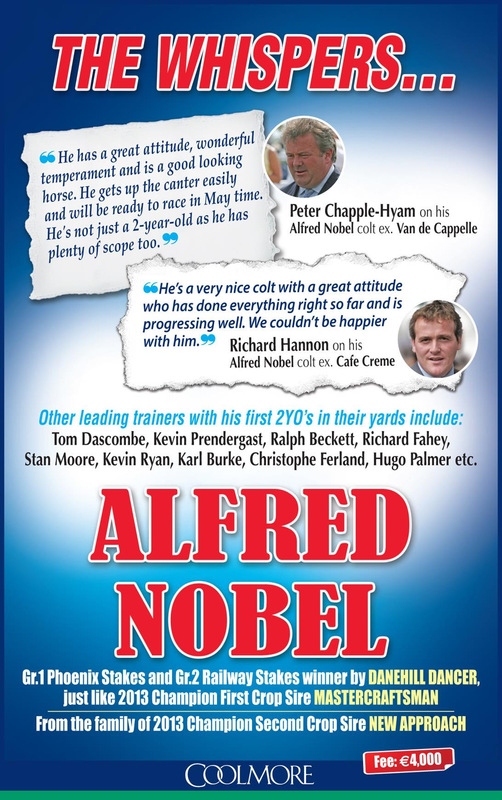 "But he'll remain with Aidan O'Brien and will be ridden by Joseph O'Brien, Coolmore were keen for that to be the case. "When he retires, Al Shaqab will also receive 50 per cent of his stud value. "He is a horse that Sheikh Joaan has always liked and pinpointed him as a horse he'd like to be involved with, especially with this weekend in mind. It's great to be involved in races like this. 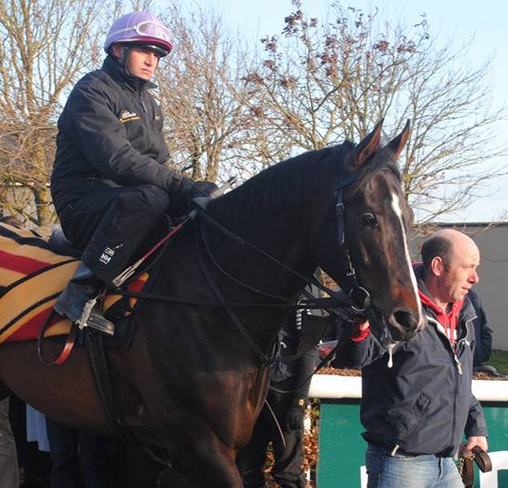 "He looks fantastic and has been vetted this morning, he travelled over especially well. Whatever happens on Saturday, it is a long season and he'll be a great addition. "He's beautifully bred and it is not easy to get involved with a Derby winner. "Sheikh Joaan spoke to John Magnier about acquiring a stake and it went from there. 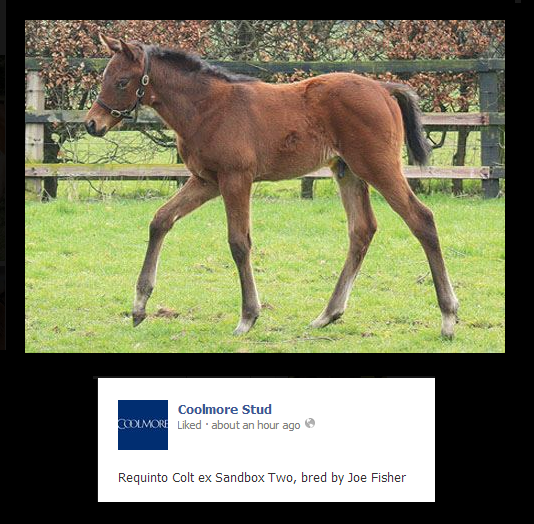 "Hopefully it is the start of a great partnership as Al Shaqab also have a share in a Galileo two-year-old with Coolmore. "If, for whatever reason, at some point in the season Joseph is unavailable to ride then Frankie (Dettori) will step in." Paddy Power make Australia just 12-1 to claim the elusive Triple Crown this year following trainer Aidan O'Brien's bullish assessment of the colt after his post-racing gallop at Leopardstown on Sunday. As a son of Galileo out of the brilliant race mare Ouija Board, Australia is certainly bred to be top-class and appeared just that when recording a scintillating victory over Free Eagle at Leopardstown in September. After watching his star three-year-old work at Foxrock on Sunday, the master of Ballydoyle said: "He goes straight to the Guineas and physically he has done wonderfully. He is the second-best horse I have ever trained and the best was not a Flat horse - the great Istabraq." Australia is already a hot favourite for both the Qipco 2000 Guineas at Newmarket on May 3 and the Investec Derby at Epsom on June 7. Two years ago the O'Brien-trained Camelot won both Classics, but was beaten three-quarters of a length by Encke when bidding to complete the Triple Crown in the St Leger at Doncaster. Nijinsky remains the last horse to complete the feat 44 years ago, but it is no surprise Paddy Power are already trying to tempt punters in, given his trainer's recent comments. The firm also make Australia 25-1 to win the 2000 Guineas, the Epsom Derby and the Prix de l'Arc de Triomphe, a hat-trick last achieved by the John Oxx-trained Sea The Stars in 2009. Paddy Power said: "Aidan has certainly started to crank up the hype about Australia and as a result punters are starting to talk about him as a possible Triple Crown horse. "But we're extremely happy not to be shortest about him for the English Derby and just wonder if the form of his Leopardstown win might just be exaggerated with doubts about whether Free Eagle was at the top of his game that day." Paddy Power offer 9-4 about Australia for the Guineas, although he is as short as 7-4 with other bookmakers. The exciting colt is 5-2 with the same firm for the Derby. Appears my twitter account been hijacked and invitation or requests to follow me on twitter to my Google - Email & Phone Contacts were sent out i apologies for the inconvenience if you were sent one not my doing Will try to get to the bottom of it. Aidan O'Brien expressed his satisfaction after overseeing in excess of 30 horses in after-racing work at the Curragh, including high-profile Classic contenders Australia and War Command. O'Brien traditionally brings his string to the opening fixture of the Irish Flat turf season, and others on show were Oaks favourite Tapestry plus classy American import Verrazano, as well as Irish Oaks heroine Chicquita, who went for six million euro at the dispersal sale of Peter Makin in November. Australia, who slammed Free Eagle by six lengths on his final start last season, currently heads the ante-post markets on the Qipco 2000 Guineas and Investec Derby, and he travelled in mid-division under Joseph O'Brien in his group, which also featured Dewhurst winner War Command (Colm O'Donoghue), who could yet head to the French Guineas. O'Brien said: "Joseph was very happy with him there - he hated the soft ground and Joseph said whatever you do, don't run him on soft. I made that mistake with Camelot and I don't want that to happen again. He goes straight to the Guineas and physically he has done wonderfully. "He is the second-best horse I have ever trained and the best was not a Flat horse. The great Istabraq. He was a class above everything he raced against. 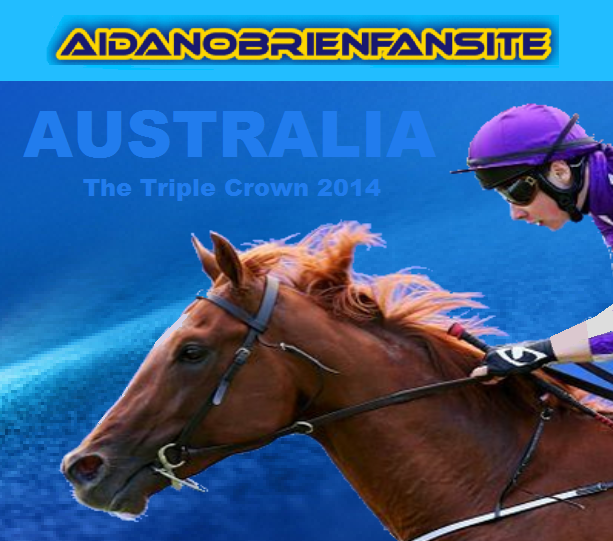 "Australia looks very good - he just has to prove it on the track. I stand over everything I said about this horse last year. He's a lovely-moving horse and we always knew he'd want good ground. He just sauntered up there today. "War Command wouldn't like soft ground either. We are training him and Australia for the Guineas, but if Australia goes to Newmarket then he could go to France. War Command is very well. Colm said he didn't like the soft there today, but that would be the same for all progeny of War Front. 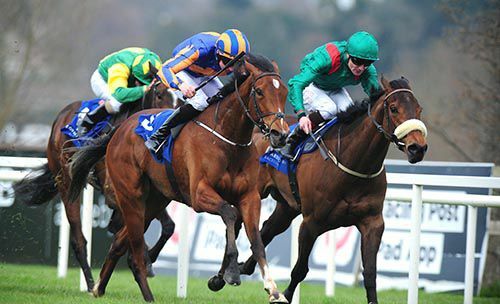 "Indian Maharaja could go for the Guineas Trial next weekend in Leopardstown. Orchestra will be trained as a Derby-type horse. He's got options - we'll look at races in Gowran or Lingfield and he'll probably go a mile and a half. "Geoffrey Chaucer doesn't want bad ground, but he wouldn't mind an ease. 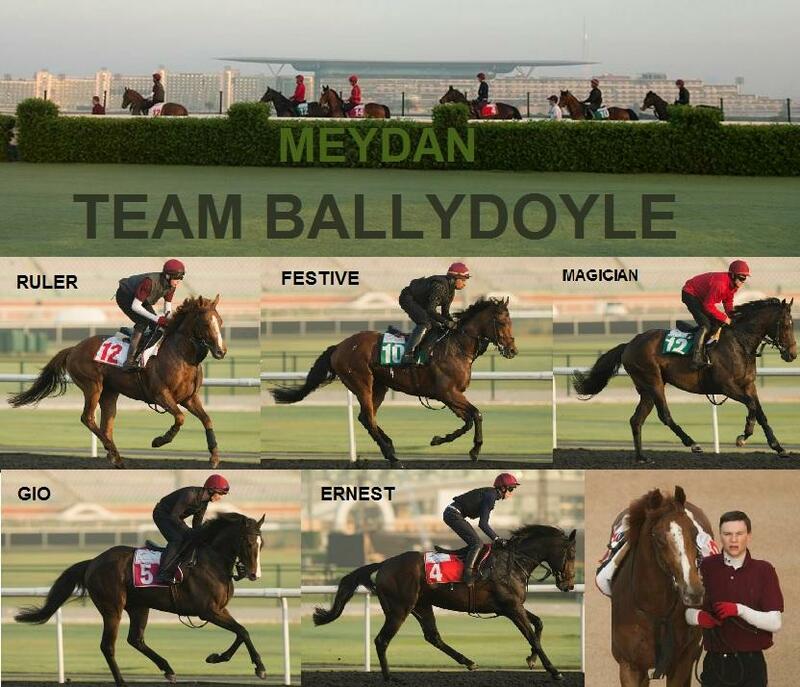 He'll be trained for the Derby and could start off in the Ballysax Stakes." Aidan O'Brien has the Yorkshire Oaks in mind as a target for his French recruit Chicquita, who won the Irish Oaks last term when trained by Alain de Royer-Dupre. The top-class filly was among the Ballydoyle workers who were on show in several groups after racing at the Curragh on the opening day of the Irish turf Flat season. Chicquita, who was ridden by Johnny Murtagh when she beat O'Brien's candidates Venus De Milo and Just Pretending by half a length and a neck in the Curragh Classic last July, was subsequently sold for six million euros at the dispersal sale of owner Paul Makin. The Ballydoyle handler said: "We are thinking of the Yorkshire Oaks for Chicquita, and a run before somewhere. She's entered in the Tattersalls Gold Cup, but it would be only an entry. We are taking our time with her and looking at the second half of the year. It was just a day away for her. "Venus De Milo has won a Group Three so we will be looking at least at Group Twos with her and like a lot of Duke Of Marmalades, she could improve a lot from three to four. "Leading Light will be trained for the Ascot Gold Cup, and may start off in Navan in the Vintage Crop Stakes, and there's also the Saval Beg in Leopardstown. "I was very happy with Tapestry, she's as forward as we would like at this stage and we can now give her an easy time and go straight for the (1000) Guineas." Dual American Grade One winner Verrazano has joined O'Brien from Todd Pletcher, and could have his first start for Ballydoyle at Royal Ascot, although a run before that has not been ruled out. 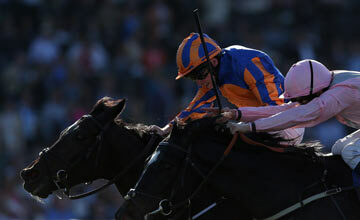 O'Brien said: "Verrazano's main aim is going to be the Queen Anne at Royal Ascot. He'll have a run before, hopefully, if that ground is OK.
"Soft ground will probably rule out the Lockinge. He won't run in bad ground. If we can't run him, we can always take him away to gallop. We're still learning about him." 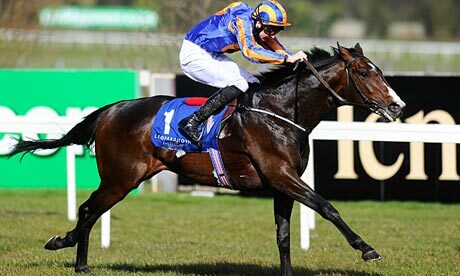 Australia is firmly on course to head straight for the English 2000 Guineas i am looking forward to him. War Command also has a Guineas agenda with the French 2000 Guineas a possible target But remains a back up if anything happens to Australia. 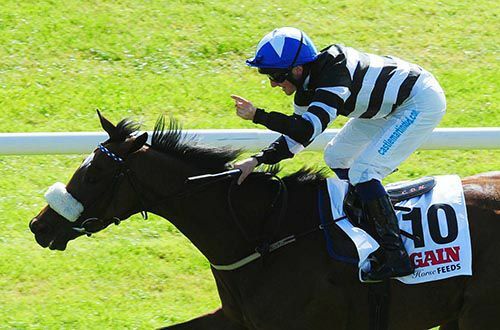 Beresford Stakes Geoffrey Chaucer is likely to start his season in next month's Ballysax Stakes. 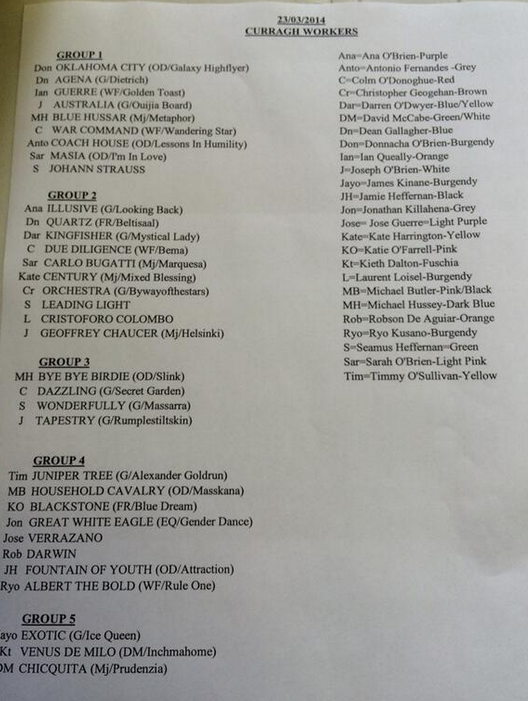 Meanwhile Leading Light is being geared towards an Ascot Gold Cup assault. 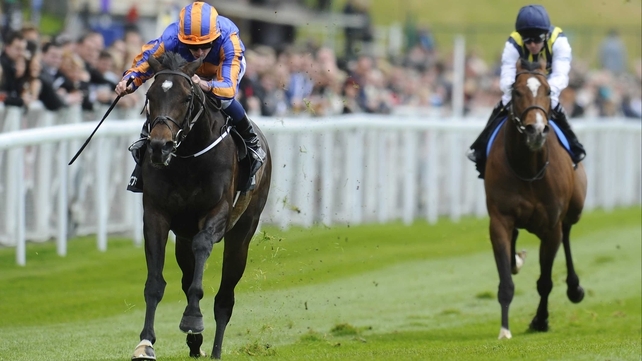 Tapestry is 'very forward' and will head straight for the English 1000 Guineas. 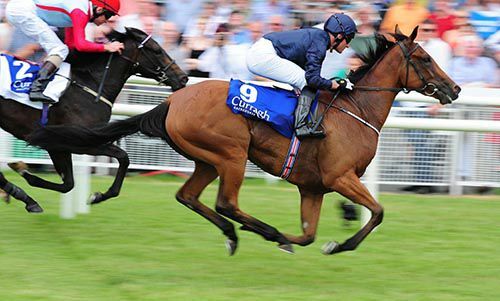 Chiquita 'isn't with us very long' reports O'Brien and she has the Yorkshire Oaks as a long term target. The unbeaten Indian Maharaja could make his return in the 2000 Guineas Trial at Leopardstown next Sunday. Australia, ante-post favourite for the 2,000 Guineas, has been confirmed as part of the Aidan O'Brien string of horses set to work after racing at the Curragh on Sunday. The regally-bred son of Galileo and Ouija Board sprang to prominence with an impressive Group 3 victory at Leopardstown last September. He will be joined in the gallop by fellow Guineas contender War Command, winner of the Group 1 Dewhurst Stakes last season. Also taking part will be leading 1,000 Guineas hope Tapestry, who was unlucky in defeat in last season's Moyglare. The Curragh is gearing up for Aidan O'Brien bringing a team of top horses to the track for a racecourse gallop after racing on Sunday. The Ballydoyle trainer has made an annual event of giving some of his star names and Classic prospects a day out as preparation for the season ahead. This year will be no exception with his string exercising after Irish Flat racing has kicked-off the new campaign with a quality card featuring the Group Three Lodge Park Stud EBF Park Express Stakes and the Irish Lincolnshire. 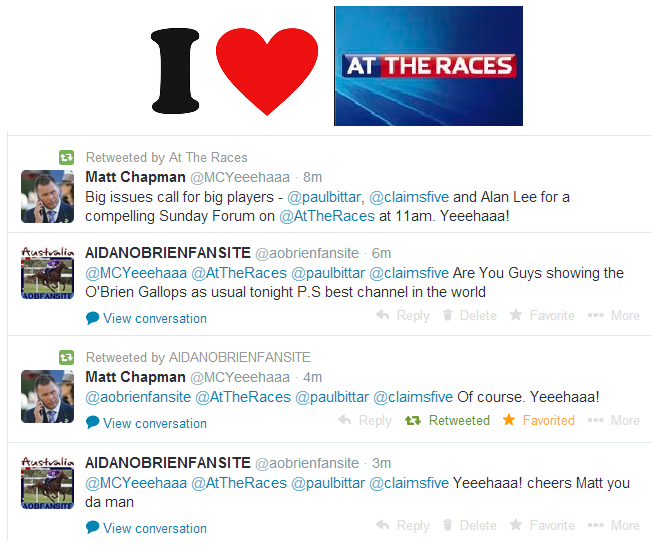 "Aidan has booked in his horses to gallop after racing and that's always a great spectacle here at the first meeting. 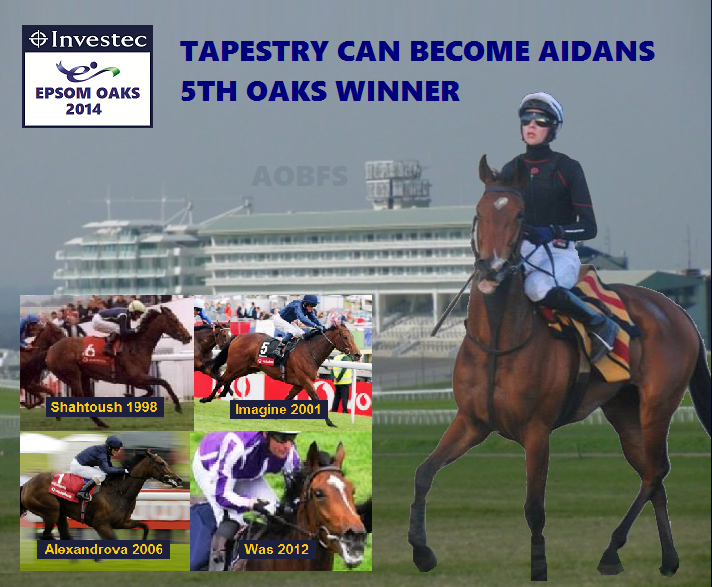 Aidan has done that for a good number of years," racecourse manager Paul Hensey told At The Races. "He generally brings a lot of his Classic contenders and all the big-name horses for a day away at the first meeting, which means there are a lot of people coming to see those horses. "It's something we are really looking forward to, seeing maybe Australia and some of the other high-profile horses. "I'm not sure exactly what is going to come but once we do know, we will let everybody know who is going to gallop. "They don't do anything too serious on the track. They generally do a good half-speed or a good swinging canter on the track, but I think the objective is to get the horses away for a day and get them focused on racing again at the start of the season. "We've been very lucky and seen all the good horses over the years from Camelot to So You Think." Hensey reports the course to be in good shape after a winter that was not as challenging as in the past. "We've not had that tough a winter. We had quite a dry spell through to Christmas and on Sunday we will be racing on ground which has not been raced on since September," he said. "We didn't get a lot of cold weather or really a lot of very wet weather through the winter. "It was a good winter on the track and we've got a good cover of grass. Fingers crossed, we could start on a lot worse." New Page Sean McMahon Fine Art Some Lovely Paintings of Aidan's Horses Well Worth a Visit. 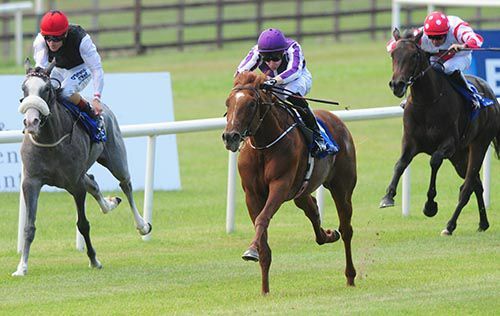 MARVELLOUS and Purr Along head a strong entry for the Group 3 Lodge Park Stud EBF Park Express Stakes on the opening day of the Irish Flat turf season at the Curragh on Sunday. Trained by Aidan O'Brien, who also has Dance With Another and Dazzling entered, the unbeaten Marvellous is a 14-1 chance for the Investec Oaks In Memory Of Sir Henry Cecil. Having taken the decision to quit riding, Johnny Murtagh could start his career as full-time trainer by saddling one of his big-name runners with Purr Along, a 1,000,000gns purchase by Qatar Racing and Newsells Park Stud, one of the 20 runners engaged in the Park Express. Odeliz has been entered for the 7f Group 3 by trainer Karl Burke while British-based trainers Kevin Ryan and Richard Fahey could be represented in the www.thetote.com Irish Lincolnshire having made entries for Trail Blaze and Lord Aerynrespectively. A total of 22 runners have been entered for the Irish Lincolnshire with Afonso De Sousa topping the weights. In the opening juvenile contest, won for the past three years by trainer Jim Bolger with Whip Rule, Dawn Approach and Saburo, 11 entries have been made including Alainn and Alertness by Bolger. AIDAN O'BRIEN is set for a major assault on Dubai World Cup night after Derby winner Ruler Of The World and Breeders' Cup Turf hero Magician featured among his likely contenders for Meydan's showpiece meeting on March 29. Magician is in line to face brilliant Japanese mare Gentildonna in the Sheema Classic, which O'Brien won with the ill-fated St Nicholas Abbey 12 months ago. Crack older horse Cirrus Des Aigles is also in line for that.The Dubai World Cup, the richest race on the planet with a prize pot of $10 million, does not feature on O'Brien's cv, but he will bid to change that with Ruler Of The World, whose opposition includes British representatives Hillstar, Mukhadram, The Fugue, Side Glance and Red Cadeaux plus ace Hong Kong horses Akeed Mofeed and Military Attack. 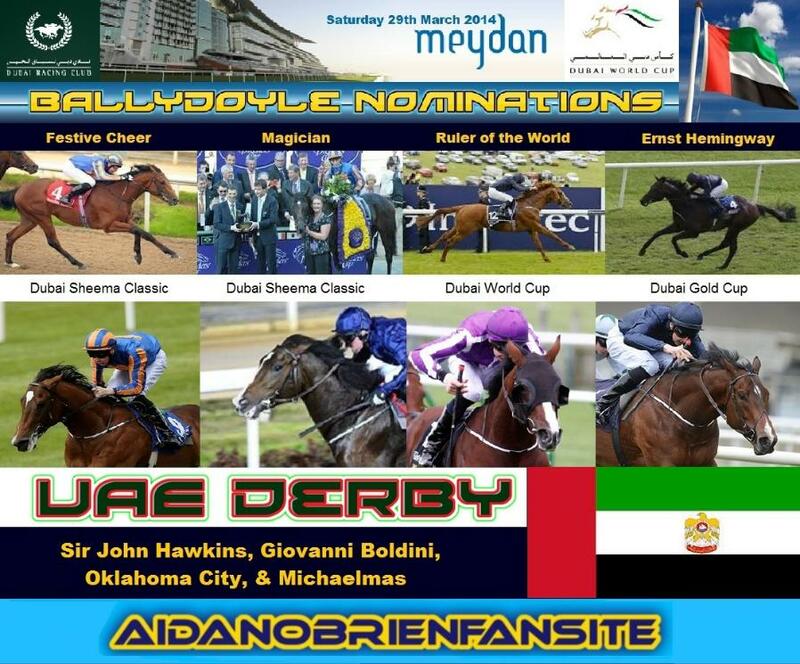 O'Brien has Ernest Hemingway engaged in the Dubai Gold Cup and Giovanni Boldini, Michaelmas, Oklahoma City and Sir John Hawkins in the UAE Derby, a race he has won for the past two years. The Sir Michael Stoute-trained Dank, winner of the Breeders' Cup Filly & Mare Turf, is one of ten remaining in the Dubai Duty Free. Contenders from Ireland, France and North America feature among the 75 entries for this year's £425,000 Group One Investec Oaks (in memory of Sir Henry Cecil), the Classic highlight of Investec Ladies' Day at Epsom Downs, Friday, June 6. Ireland's champion trainer Aidan O'Brien has sent out the winner of the mile and a half Classic four times and the Ballydoyle handler is responsible for 11 contenders this year headed by Tapestry, who is 8/1 favourite with Coral, official betting partner of the Investec Derby Festival. The daughter of Galileo captured the Group Two Debutante Stakes at the Curragh in August before being promoted to second behind the Clive Brittain-trained Rizeena after meeting trouble in running in the Group One Moyglare Stud Stakes at the same course in September. 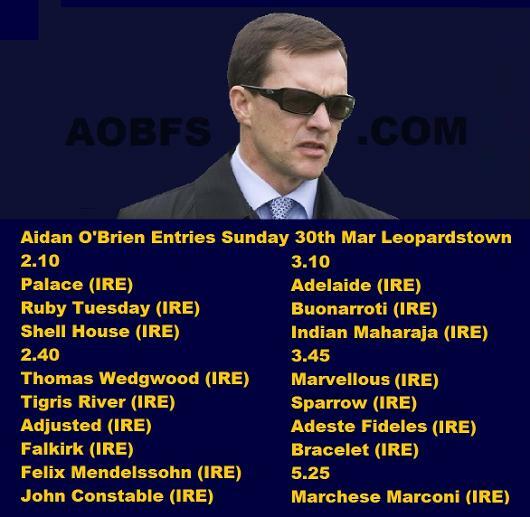 O'Brien's entries also include Group Three scorer Wonderfully, Leopardstown maiden winner Bracelet, Adeste Fideles, a daughter of the 2001 Oaks winner Imagine, plus Dance With Another and Sparrow, whose dams both finished second in the Epsom Downs fillies' Classic. changes. 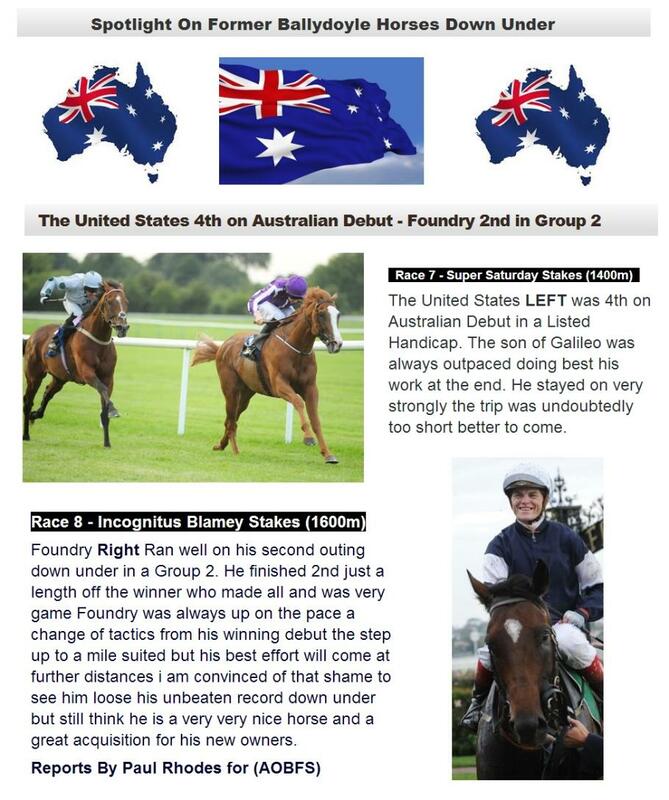 For full Details & Pedigree for each 2yo Check the Horses to Follow Page. Montjeu x Cherry Hinton he will stand at Park House Stud. St Nicholas Abbey winning the Coronation Cup in 2011. Image copyright of Racingfotos.com. 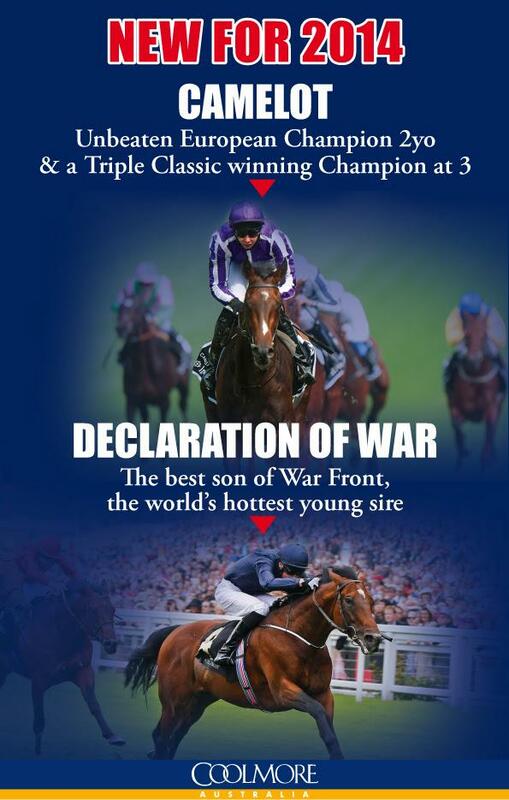 This year's Coronation Cup at Epsom will be run in commemoration of British Champions Series star, St Nicholas Abbey. The seven-year-old, who was retired following a pastern injury sustained at Ballydoyle gallops last July, sadly passed away in January. However, St Nicholas Abbey will now be honoured in the official naming of a race that he managed to win astonishingly three times on the trot. Epsom's head of racing and clerk of the course Andrew Cooper, said: "In completing the unique achievement of winning three consecutive Investec Coronation Cups, St Nicholas Abbey left an indelible impression on all of us at Epsom. "We followed his brave fight to recover from serious injury with keen interest and with our fingers crossed. "We are grateful to Coolmore for allowing us to honour this magnificent racehorse at this year's Investec Derby Festival." The race will be titled the Investec Coronation Cup (In commemoration of St Nicholas Abbey). 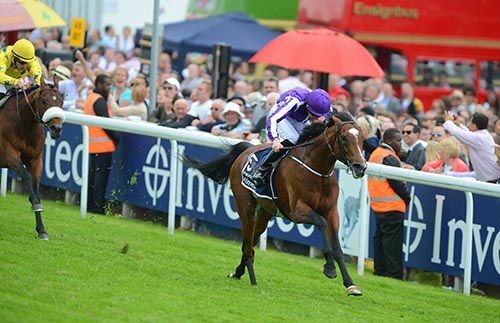 This year's Investec Coronation Cup at Epsom will be run in commemoration of three-time winner St Nicholas Abbey. Aidan O'Brien's multiple Group One winner won the Coronation Cup twice under the trainer's son Joseph and once in the hands of Ryan Moore, but sadly passed away earlier this year following a lengthy battle with injury and subsequent complications. St Nicholas Abbey is the most successful horse in the history of a race first run in 1902 and Epsom's head of racing and clerk of the course Andrew Cooper feels it is a fitting tribute to run the race in his honour. Cooper said: "In completing the unique achievement of winning three consecutive Investec Coronation Cups, St Nicholas Abbey left an indelible impression on all of us at Epsom. Horse Racing Ireland chief executive Brian Kavanagh believes Irish Champions Weekend is an ideal opportunity to put racing here in the spotlight. 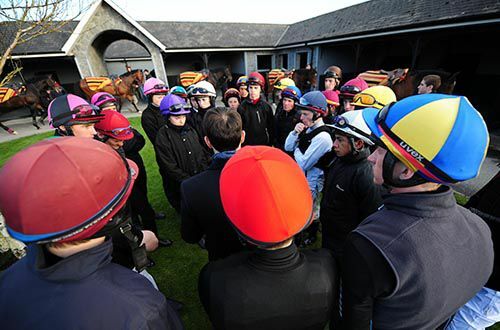 Kavanagh was speaking as the programme for the two-day extravaganza on September 13th and 14th which features two of the country's biggest races in the calendar, the Irish Champion Stakes and the Irish St Leger at Leopardstown and the Curragh respectively, was announced. "Irish Champions Weekend will, in effect, become the first leg of a European triple crown of end-of-season festivals, to be followed by the Arc meeting in France and British Champions Weekend," he said. "This will be a showcase for Flat racing in Ireland, creating a high-profile event to attract the best horses in the world and to demonstrate the value and importance of the Irish Flat breeding and racing industry. "We believe that it will quickly establish itself as a major racing attraction at home and become part of the calendar for international flat racing fans. "Flat racing worldwide is moving more and more towards high-quality international meetings and it is appropriate that with Irish Champions Weekend, Ireland will now have a meeting which can bear comparison with all other major international racedays." The race programme includes five Group Ones, two Group Twos, three Group Three races and four premier handicaps each worth €150,000. Total prize-money will amount to €3.73 million with the Irish Champion Stakes at Leopardstown being raised from €750,000 to €1m. 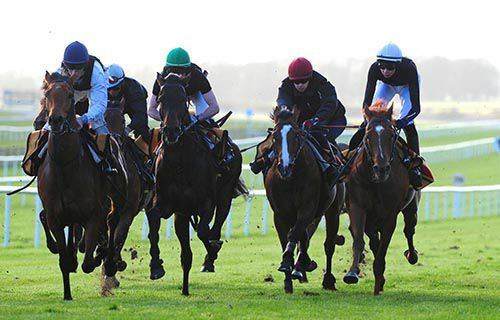 Leopardstown's manager Pat Keogh said: "The record of the Irish Champion Stakes as one of the world's top flat races gives us the perfect starting point for this exciting new concept for Irish racing. "With more than €2m in prize-money on offer, Leopardstown looks forward to welcoming the cream of international racing to the first of two wonderful days of competition." Paul Hensey, the Curragh's general manager, said: "This is a unique opportunity to create a new sporting weekend of international significance. 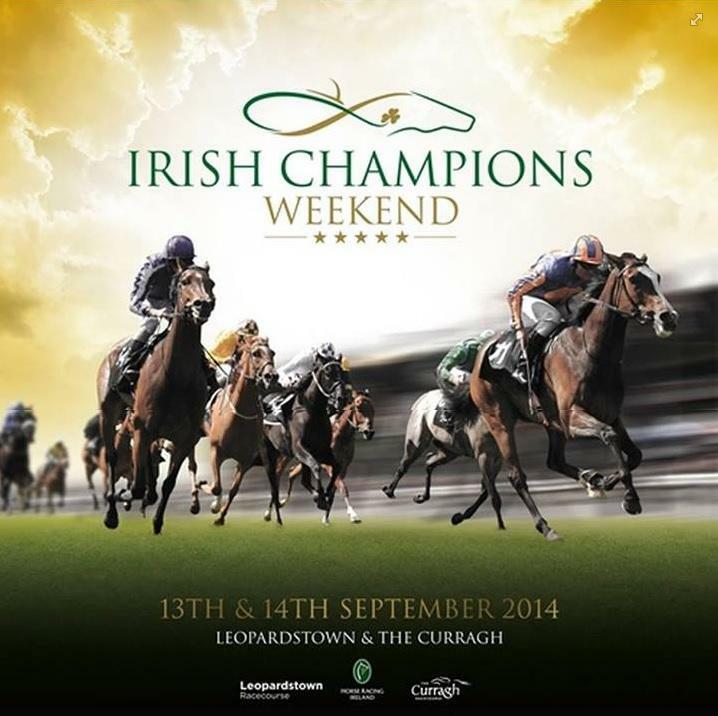 "We will celebrate the 100th running of the Irish St Leger this year. In addition we have the Group One Moyglare Stud Stakes and Goffs Vincent O'Brien National Stakes, which has been won by six of the last nine European champion two-year-olds."